Staphylococcus aureus is the major pathogen leading to bovine mastitis globally while livestock-associated methicillin resistant S. aureus (LA-MRSA) has become a potential threat to public health. MRSA from bovine mastitis is not common but a methicillin susceptible S. aureus (MSSA) genotype, rpoB sequence type (RST)10-2 (RST10-2), is prevalent in Korea. To date, many genomic sequences from S. aureus have been elucidated, but the complete genome sequences of RST10-2 MSSA from bovine mastitis has never been reported. 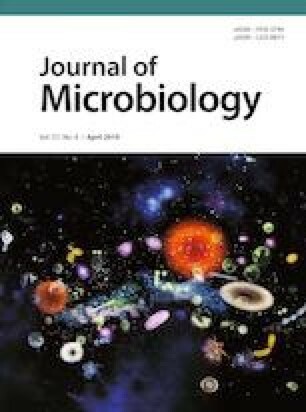 In this study, we determined the complete genome sequence of two RST10-2 MSSA that differ from each other in staphylococcal protein A and molecular prophage types [PMB64-1 (t2489/ mPPT0) and PMB81-4 (t127/mPPT1-2-3)] and conducted a comparative genomics study. The genomic sequences of PMB64-1 and PMB81-4 were more homologous to the representative human RST10-2 strains (MSSA476, MW2 etc.) compared to other RSTs. Most of them shared five common pseudogenes, along with high amino acid identity of four variable virulence genes that were identified in this study. However, PMB64-1 and PMB81-4 acquired different strainspecific pseudogenes and mobile genetic elements than the human strains. The unique pseudogene profile and high identity of the virulence genes were verified in RST10-2 field strains from bovine mastitis. Thus, bovine mastitic RST10-2 MSSA may have an evolutionary relationship with the human RST10-2 community-associated (CA) MSSA and CA-MRSA strains but may have adapted to cows. Supplementary material is available for this article at https://doi.org/10.1007/s12275-019-8699-1 and is accessible for authorized users. Supplementary material, approximately 908 KB.